Does President Obama know what’s in the voluminous bills Congress is wrestling with these days? We already know that few, if any, members of Congress read the entire bills; some probably read none of them. They’re extremely long and sometimes distributed in pieces just before votes. Moreover, the public has no reasonable opportunity to read or understand them before they’re voted on (another campaign promise down the tubes). 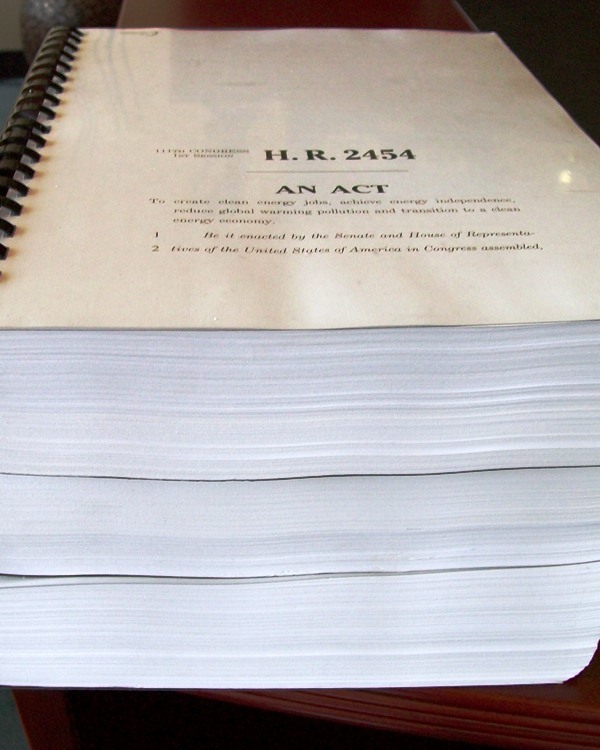 The House version of the energy (cap-and-trade) bill shown here is so big that it’s virtually certain no member knows most details of what he or she is voting on. But that’s the way it is these days, and later this year, if the House and Senate can reconcile their varying versions, we may have energy, health, and additional stimulus laws on the books that no one knows much about — just like the previously passed stimulus legislation. President Obama likely knows even fewer details than the average member of Congress. He fights the big fights, champions the principles, soars above the minutiae. The point was made this week when, according to an article in The Huffington Post, the President participated in an invitation-only conference call with “like-minded … prominent progressive bloggers.” He wanted them to help control rumors and myths and help promote his health care reform legislation. During the call, a blogger from Maine said he kept running into an Investors Business Daily article that claimed Section 102 of the House health legislation would outlaw private insurance. He asked: “Is this true? Will people be able to keep their insurance and will insurers be able to write new policies even though H.R. 3200 is passed?” President Obama replied: “You know, I have to say that I am not familiar with the provision you are talking about.” (quote begins at 17:10) This is a truly disturbing admission by the President, especially considering that later in the call, Obama promises yet again: “If you have health insurance, and you like it, and you have a doctor that you like, then you can keep it. Period.” How can Obama keep making this promise if he is not familiar with the health legislation that is being written in Congress? Details matter. You can listen to a recording of the conference call at The Huffington Post article. Even if, under the new Health legislation, private insurance is outlawed, it is doubtful any private insurance company will be able to compete with a government plan that — like every government program — does not have to make a profit and will happily accept losses.